Congratulations! You’re now a drama teacher, which means you also now realize how much larger this job is than you ever imagined. Beyond lesson plans lurks the world of field trips, facilities, casting, directing, equipment, parents, finances, conferences, competitions, and collaboration. As one reviewer describes, Real-World Theatre Education is “a nuts and bolts handbook that will walk an educator through the academic year, preparing them for both curricular and extra-curricular demands. It’s more than just a checklist. 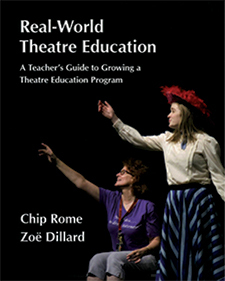 Read more...It is a reality check in the best possible way: an honest, thorough guide to growing a successful theatre education program.” Eleven chapters steer you through the rewards and the pitfalls of both the classroom and the production with details on everything from working at multiple locations to preparing for a substitute to teaching kissing. You’ll also love the extensive appendices that provide useful checklists, lesson plan templates, and example forms from production contracts to rehearsal schedules! Highly readable with true stories from other theatre educators, this irreplaceable guidebook tells you how to prepare for situations you may not have even considered. Learn to build a booster club, diffuse divas, connect with colleagues, organize productions... and keep your head above water!